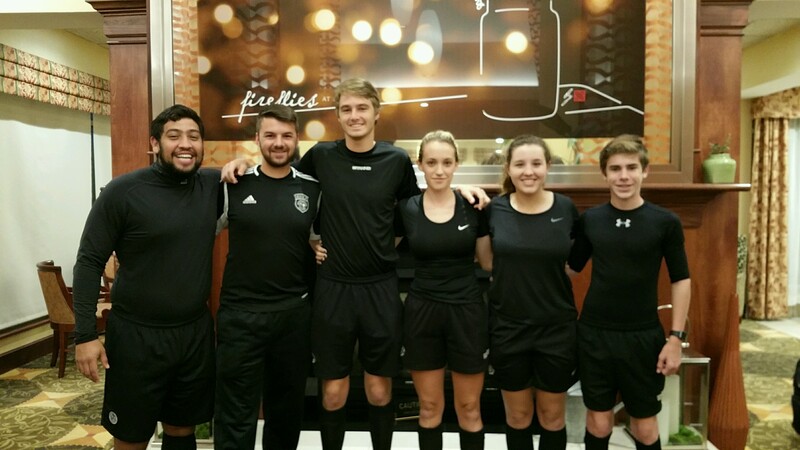 Winston-Salem, NC: L to R; Leonard Gonzalez, Nate Mitchell, Frank Hobson, Sara Griggs, Lydia Ratliff, Jack Burroughs. US Soccer hosted the Developmental Academy 13/14 Boys East Regional Showcase at the BB&T Soccer Park on 27, 28 & 29 October. This is a US Soccer invitation and identification event. The referee administrative staff from Chicago was in attendance, again, this year. All matches were filmed and national referee coaches (assessors) are assigned to every match to observe the referee teams to include pregame conferences, provide halftime guidance and match debriefs. Matches began at 1200 on Friday and continued through Sunday at noon. Great job by all six (6) dedicated SC Referees. Everyone worked a minimum of six (6) matches. Thank you, to the ARA’s that responded and, especially, the Upstate, Rock Hill, Sumter and Charleston for their effort to select and submit very deserving, young and talented referees.